A number of Mompou series have come and gone. Most, like the one under review, make no pretence to being complete editions of the solo piano music. Their aim is to focus on Mompou’s best and most characteristic writing for the instrument. 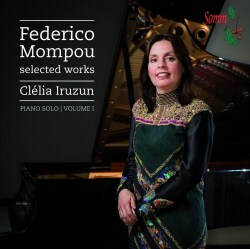 In this volume, for example, Brazilian pianist Clélia Iruzun takes three important sets and adds the small scale Pessebres to create a good-looking recital that ranges over a half-century of composition, from 1911 to 1962. She plays the first six of the cycle of twelve Cançons i Danses. As with almost all performers of their own music, Mompou, who recorded a mammoth series of his own works in 1974, is a direct, no-nonsense exponent. When the elderly but still digitally adroit Mompou recorded this set he was wholly attuned to the dance dynamism inherent, whereas later performers strive rather to bring out the music’s warmth and expressivity. These qualities were certainly not alien to Mompou but his light pedalling and rather dry approach kept sentiment in its place. Thus it is with Iruzun, whose rich balanced chording illuminates No.5 but whose second piece sounds rather lingering and a touch studied when set besides Mompou’s own recording. Nevertheless I certainly prefer her sixth piece to the performance by Olena Kushpler on Capriccio C5115 who is much slower and, whilst appealing, somewhat at odds with the tenor of the music. The cycle Impresiones Intimas was written between 1911 and 1914. Unlike Cançons i Danses, of which Kushpler gives us Nos 5-12, Iruzun plays the full set. The two pianists’ qualities prove complementary. There is little tempo disagreement; indeed they both disagree with the composer himself in the larghetto of No.2, where hardly anyone (for once) is as slow as Mompou. They are both explorers of harmony and of colour. I would only suggest that in the Melancholy Bird sketch, Olena Kushpler sounds just a touch mannered. Pessebres is a brief three-movement cycle that is unusually extroverted for Mompou. The dance, the hermit and the shepherd are all very well characterised by Iruzun, and the last in particular is a terrific study where Iruzun is a touch slower and more reserved than in the composer’s own recording. Finally there is the Variations on a theme of Chopin, written over a two-decade span between 1938 and 1957. This charming, genial set of variations (theme, twelve variations and an epilogue) form character pieces of great directness and consistency. They also sound highly attractive, not least in a performance such as this. With a warm but sufficiently detailed church acoustic, and very sympathetic performances, this is another Mompou entrant that one can encounter with confidence.